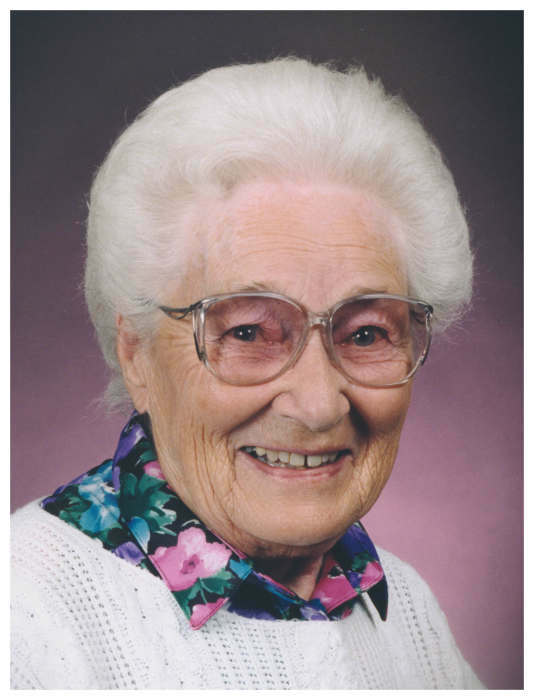 Evelyn Frances Onstine was born to Frederick B. H. Kemper and Beulah Mae (Hood) Kemper on September 19, 1917 in Powell, Wyoming. She passed away on December 4, 2018 at the Powell Valley Care Center. Evelyn graduated from Powell High School with the Class of 1936 and rarely missed a class reunion.. Evelyn met the love of her life Charles Walter Onstine and they were married on July 29, 1939 in Billings, MT. To this union were born five daughters and one son: Sharon Cope, Forsyth MT; Shirley (Fred) Cawiezel, Morrill, NE; Susan (Darrel) Benner, Grand Coulee, WA; Charla Henke-Brenchley, Grand Coulee, WA; and Mary (Barry) Flom, Green River, WY. Their son died at birth in 1954. Some of Evelyn’s most memorable years were found in her life spent with Chuck on the farm and raising their girls was a paramount force of their lives together. She was a feisty, hard-working and loving mother and friend. Evelyn will always be remembered for her love of flowers and gardening and enjoying the lives of her daughters and grandchildren. She particularly enjoyed driving around the Powell Valley and reminiscing about her lifetime spent there. She was a member of Union Presbyterian Church, the Ralston Club, the Riverside Club and the American Legion Auxiliary. She is survived by five daughters, ten grandchildren, twenty great-grandchildren, five great-great-grandchildren with two more on the way. She was preceded in death by her loving husband, son, parents, brothers Ben and Fred Jr., sister Mary Ellen, and three sons-in-law. Services will be held on December 28th at 11:00 A.M. at the Union Presbyterian Church. A family celebration of life will be held at a later date for the interment of her ashes. Memorials may be sent to Northwest Community College or a charity of your choice.